In slicing the 'performance' loop in the Sample editor, I used a relatively high sensitivity setting, but still needed to add a couple of extra hitpoints (the darker blue lines) manually. In last month's workshop, I used VariAudio to obtain MIDI notes from audio parts, but this approach won't work for drum replacement. 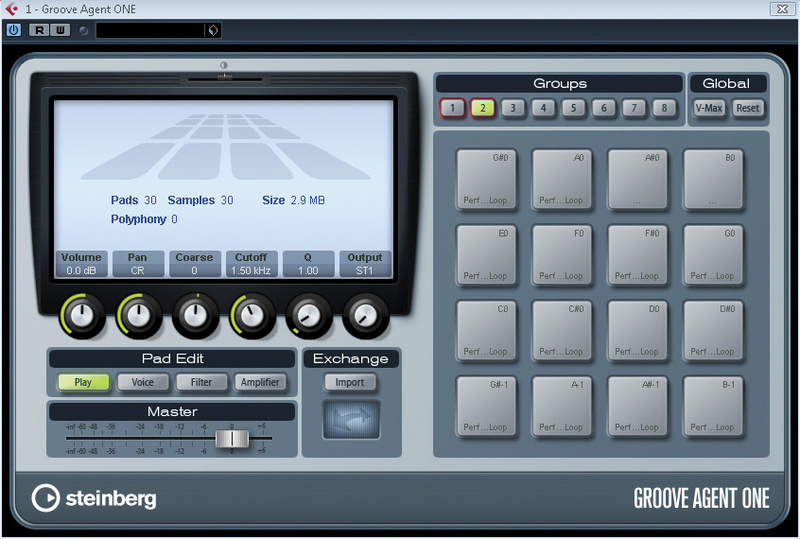 In SOS May 2007, Matt Houghton discussed drum-replacement tools for Cubase, but if you only have a few drum loops in which you want to replace some sounds, the Groove Agent One drum machine offers an alternative approach. Let's consider a simple, yet common scenario involving two drum loops. The first contains the performance that's required, and to which performances by other musicians have been overdubbed, but the specific drum sounds feel a little tame and need beefing up. Having discovered suitable sounds in a second loop, your task is to keep the groove and timing of the first, but to replace some of the actual sounds with hits from the second. I'll work through this example using two loops: a four‑bar 'performance' loop and a two-bar 'sounds' loop, both of which you can download from the SOS web site (/sos/dec09/articles/cubasetechmedia.htm). Initially, all Groove Agent One's 128 pads are empty but dragging and dropping sliced loops onto a pad automatically maps the slices across a series of pads. Here, the 'performance' loop has been mapped across almost all the pads in the first two groups. The red highlights around the Group 1 and 2 buttons show that pads within those groups are in use, while the green highlight indicates that we are viewing the pads in group two. Audio can be dragged and dropped into Groove Agent One in several ways, which are described in the Plug‑in Reference PDF manual, but when working with loops rather than single hits, some preparatory work is required in the Sample and Audio Part editors. 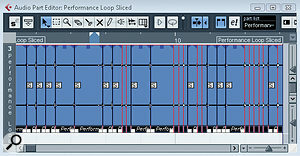 The first step is to slice the two loops into their individual beats, using the Hitpoint tool in the Sample editor. Increasing the Sensitivity setting adds hitpoints: the aim is to get a hitpoint at each transient created by an individual drum hit. Once you have this about right, click the Edit Hitpoints button to manually add (by holding the Alt or Option key and clicking on the waveform display as I've done in the screenshot above) or delete hitpoints as required. Hitpoint positioning can also be adjusted, and holding the mouse button down over an individual slice auditions it, making it easy to hear where edits might be required. Once the hitpoints are sorted, pressing the Slice & Close button exits the Sample editor and creates an audio part (in the Project window) containing the sliced loop. Having sliced the loop in the Sample editor, opening the resulting audio part allows us to select all the slices and then drag and drop them into Groove Agent One. When you open a new instance of Groove Agent One, all 128 pads (16 pads in each of eight groups, with each pad triggered via a different MIDI note) are empty. We now need to map each slice from our two loops to individual Groove Agent One pads, which requires a quick visit to the Audio Part editor for each loop in turn. Double‑click one of the audio parts to open it in the Audio Part editor, and select all the events (each slice) using Ctrl-A (PC) or Command-A (Mac). The parts can be dragged and dropped to an empty pad in Groove Agent One, and when you let go of the mouse button, each slice is automatically mapped to consecutive pads, starting from the pad you dragged onto. I find it easiest to place my first loop (the 'performance' loop) on the first pad of group one. In this case, because it has four bars' worth of slices, it pretty much fills up all the pads in group two also. Once you've dropped the first loop into Groove Agent One, the double‑headed arrow icon in the Exchange section lights up. Dragging and dropping from this icon back into the Project window creates a MIDI file that, when played back to Groove Agent One, will trigger each slice in turn, recreating the original drum performance. 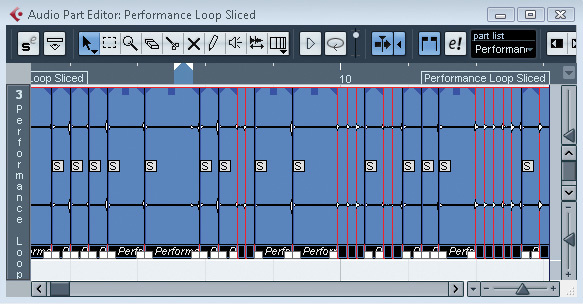 The left‑hand pane shows the MIDI part generated by Groove Agent One to play back the 'performance' loop. I've manually selected all the MIDI notes that trigger a kick-drum slice. In the right‑hand pane, I've moved all these 'kick-drum triggers' to the same MIDI note, which means that they'll now trigger the same slice in Groove Agent One. Both loops are now sliced and mapped across Groove Agent One's pads, and we have a MIDI part that can trigger our 'performance' loop. Before we swap some of the hits in our 'performance' loop for those from our 'sounds' loop, a bit of MIDI editing is required. 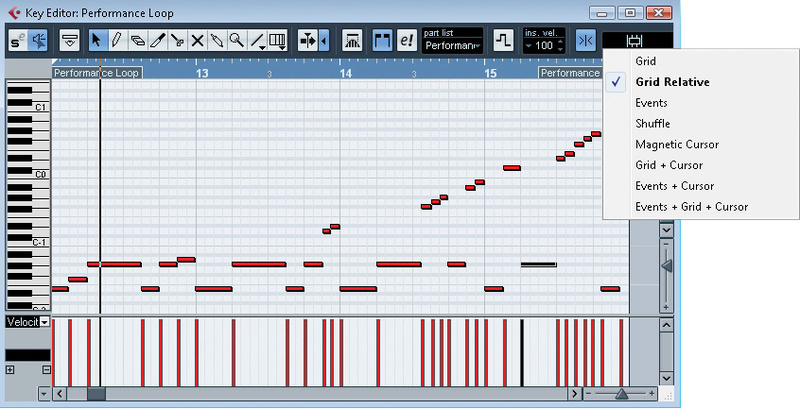 The left‑hand side of the Key Editor screenshot below shows the original MIDI part for the 'performance' loop, and I've highlighted each of the main notes that trigger a kick‑drum slice. As you can see, there's a different note for each kick‑drum hit from the original loop. The right‑hand side of the screenshot shows an edited version of the same MIDI part, but I've moved all the MIDI notes that trigger a kick-drum sample to the same MIDI note. Playing back the MIDI part now will still give you pretty much the same performance, but each occurrence of the kick drum will now trigger the first kick-drum slice, rather than those from later in the loop (you can check this by watching which pads light up in Groove Agent One as slices are triggered). Note that it's best to use the Grid Relative snapping option when moving these MIDI notes, as you are less likely to alter the exact timing of the MIDI notes that trigger each slice. The same process can be repeated for each of the other drum sounds in the loop, the most obvious ones being the snare, closed and open hi‑hats, and any tom or cymbal sounds. What you're trying to do is get the loop to play back using a smaller number of MIDI notes (and, hence, a smaller number of Groove Agent One pads) than the original. I narrowed the selection down to four MIDI notes that focused on the key elements I wanted from the 'performance' loop: the kick, snare, an open hi‑hat sound, and a second snare that wasn't a full hit in the original loop, and therefore sounded different to the main snare hits. The same process has been repeated for MIDI notes for all the key drum sounds. 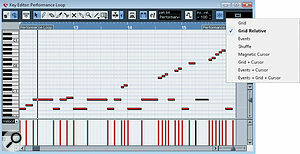 Note that the Grid relative setting makes it easier to move the pitch of a MIDI note while maintaining its timing position. The last step is the easiest of all. Groove Agent One lets you drag the sample from one pad and drop it onto another, simply swapping the pad assignment of the two samples. So, in our example, the kick drum is being triggered by MIDI note E2. Having auditioned the pads containing the slices from the 'sounds' loop, I thought the best kick hit was found on pad C1, and simply clicking on this pad, holding the mouse button down, pointing at the Group 1 button (which toggles the Groove Agent One display to the first group of pads), I was able to drop this replacement kick sound onto pad E2. It was then a case of simply repeating the same swapping process for each of the key sounds in the loop. While you might sometimes require a little further processing to smooth out the transitions between slices (for example, a light dusting of reverb to 'glue' the new loop together), the job is now pretty much done. 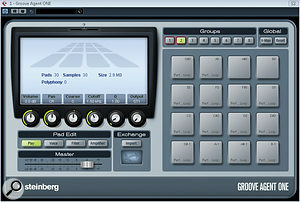 However, if you want to blend two sounds together, rather than opt for complete replacement (for example, layering two kick drums for extra definition), it's simply a matter of duplicating all the MIDI notes that trigger the original kick-drum slice and allocating these copies to a second MIDI note that belongs to the pad containing your second kick sample. The relative levels between the two can then be adjusted via the respective MIDI velocities associated with each pair of notes. So next time you like the way your drummer has played, but perhaps not the way the recording sounds, Groove Agent One might be just what you need to get out of a scrape!